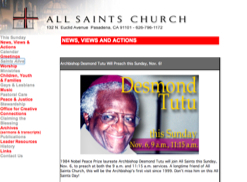 8 November 2005 — Rector J. Edwin Bacon of All Saints Episcopal Church in Pasadena told many congregants during morning services on Sunday that a guest sermon by the church’s former rector, the Rev. George F. Regas, on Oct. 31, 2004, had prompted a letter from the Internal Revenue Service (IRS). In his sermon, Regas, who from the pulpit opposed both the Vietnam War and 1991’s Gulf War, imagined Jesus participating in a political debate with then-candidates George W. Bush and John Kerry. Regas said that “good people of profound faith” could vote for either man, and did not tell parishioners whom to support. It was recently revealed that Bush believes God told him to go to war – something that has been robustly challenged by Christians on both sides of the Atlantic. On June 9, the church received a letter from the IRS stating that “a reasonable belief exists that you may not be tax-exempt as a church … ” The federal tax code prohibits tax-exempt organizations, including churches, from intervening in political campaigns and elections. As Bacon spoke, 1984 Nobel Peace Prize winner Archbishop Desmond Tutu, a co-celebrant of Sunday’s Requiem Eucharist, looked on. “We are so careful at our church never to endorse a candidate,” Bacon said in a later interview. Telephone calls to IRS officials in Washington, D.C., and Los Angeles were not returned. After the initial inquiry, the church provided the IRS with a copy of all literature given out before the election and copies of its policies, Bacon said. But the IRS recently informed the church that it was not satisfied by those materials, and would proceed with a formal examination. Soon after that, church officials decided to inform the congregation about the dispute.